"This is an evolution, not a revolution." This is how Claude Onesta on Wednesday summed up the changes which are about to take place at the head of the French men's national team. 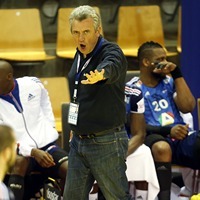 After having been in charge for 15 years, the 59-year-old will take a step back and become the team's general manager, while Didier Dinart will become the team's head coach. Dinart, one of the best defenders of his time, has been with the team since the 2014. Joining him will be former HSV Hamburg and Chambéry Savoie Handball centre back Guillaume Gille who played 308 times for France and won six titles including the EHF EUROs in 2006 and 2010. "I'll will be working along Didier in the management of the squad, but I'll also take care of the physical preparation from now on," Gille explained on Wednesday. Claude Onesta will take up much of the side tasks, like promotion with sponsors or some of the media obligations. "It's easier for them (Dinart and Gille) to find their rhythm if they only have to focus on the court," he said. "Then there will come a time when I'll retire and they'll be the only ones in charge." An outsider might think that such a decision, taken 100 days before the beginning of the World Championship 2017 in France, is a strange one. To avoid further problems, the decision to install Dinart and Gille on a joint throne was taken, but none of the two will have more power than the other. “For me, they are both coaches and I'll be above them. They will have complete freedom regarding what's going on on the court, but I'll be there to tell them to change if I think something's not right,” said Onesta. The issue for the French federation was to make sure that the success of the past decade and more that saw the team winning EHF EURO, World Championship and Olympic gold would not to stop any time soon. “Only time will tell if the decision we made was right,” said the federation’s president Joël Delplanque. “We will meet in February, take a look at the results of the World Championship and then see what we have to do." The change is effective as of now and Dinart and Gille will be sitting on the bench at the EHF EURO 2018 qualification matches against Lithuania and Belgium in November. Even though there was no hint as to which players will be nominated called, Claude Onesta confirmed he will still be very much a part of the selection process. “They will choose, that's for sure, but if I see something that I think is wrong, I will tell them right away.” he exposed. Additional changes will be made after the World Championships when also the team staff will change. changed. For France, this then marks the beginning of a new cycle leading all the way to the 2020 Olympics in Tokyo, and the team has definitely decided to go into it with a bang.